This story was produced as a project for the 2018 National Fellowship. A school bus on the unpaved Indian service route 5010 near Sanostee. The seven-mile corridor connects as many as 2,500 residents to the outside world – or denies them access altogether. Sharon Begay knows this road by heart. The 43-year-old mother of two has spent a lifetime memorizing the jagged surface and thuggish boulders that define Indian service route 5010. Locals just call it “the road” and gauge distances with landmarks: windmills, S-curves, a water tower covered with graffiti that once served as the town’s main source of gossip. It’s an unpaved byway in the Sanostee chapter of the Navajo nation that feeds a network of unnamed dirt roads, serving hundreds of families in the shadows of the Chuska mountains. Generations of Begay’s family have herded sheep along this road; as a child she traveled it by horseback, alongside her father. Nearly everyone in the Sanostee chapter has a story about Indian service route 5010, a seven-mile corridor that connects as many as 2,500 residents to the outside world – or denies them access altogether. Rain or snow transforms the dirt into mud so thick that 15-ton school buses get mired up to their axles. School districts cancel classes. People can’t get to work or reach the main highway, US 491, to access grocery stores – the nearest of which is 40 miles north. The chapter’s Authorized Local Emergency Response Team (Alert) routinely dispatches volunteers to check on the most vulnerable residents, delivering food, wood and hay for livestock. The mud bogs derail ambulances or delay their arrival for hours or even days. In the worst cases, aid comes by helicopter. At about 27,000 sq miles, or roughly the size of West Virginia, the Navajo nation is the country’s largest Indian reservation. It is also one of the most rural pieces of America, spanning parts of three western states. Since time immemorial, the Navajo have laid claim to these stark landscapes, where daily life and survival are intimately tied to the earth, to changing seasons, and to the traditions passed from one generation to the next. Although collective oral histories stretch back thousands of years, most family stories begin in 1868 – the year the Navajo signed a treaty with the United States that ended their incarceration at Bosque Redondo and allowed them to return to their ancestral homeland. A 1969 congressional report excoriated the BIA for refusing to create basic roadways that would allow Native American families to stay intact and access an education. Not much has changed in the last 50 years. With a population hovering around 400, Sanostee is a tight-knit community. Yet one rainstorm can cut the chapter in pieces, washing out bridges and culverts and stranding residents. “In denying us roads, the federal government has denied us access to basic human rights like education and healthcare,” she said. For Cindy Theodore, transportation coordinator for the Central Consolidated School District (CCSD), watching the weather and predicting road conditions is a full-time job. 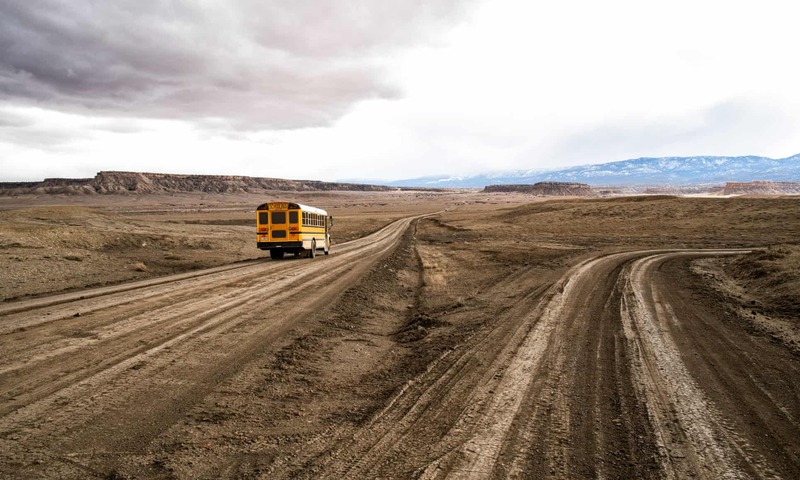 The nearly 3,000 sq mile school district in rural north-west New Mexico serves a predominantly Navajo student population, and 95% of its bus routes are dirt. The district implements a system of “bad weather stops” for as many as 15 days a year. That means schools buses don’t travel their full route because of rain, snow or mud – forcing parents to deliver their children to alternate locations, or to keep them home until the roads dry out. “If we’re expecting weather coming in, I leave the bus yard at about 4am and go out to drive the route to see if it’s safe,” Theodore said. Every day of missed school affects students’ academic performance, said Terrian Benn, CCSD’s interim superintendent. New Mexico consistently ranks last in the country in categories like quality of education and overall child wellbeing, and Benn believes poor roads are partly to blame. In the last decade, the road crisis in Indian country has been the topic of at least eight US Senate hearings, during which New Mexico’s congressional delegation has lambasted the federal government and the BIA for their neglect of tribal transportation systems. NDOT operates with a yearly budget of about $60m, money that comes from the Federal Highway Administration, fuel excise taxes and the tribe’s general operating fund. Of that, more than $5m per year goes to blading – or grading – unpaved roads. Blading costs $750 a mile, and it lasts only until the next big rain. The $5m budget covers blading for 15 miles of roads a chapter per quarter. The cost for permanent improvements is astronomical. According to the most recent estimates, pavement costs $3m a mile, while cheaper alternatives such as double chip seal or gravel cost $350,000 and $250,000 a mile, respectively. Just putting down gravel on all the Navajo nation’s roads would cost more than $2bn. The BIA holds the right of way on about half of the dirt roads on the Navajo nation. Searchlight New Mexico made repeated attempts to interview the director of the BIA’s Navajo regional office – without success. Now nearing 70, Emil Benally and his wife, Jean, are raising their four-year-old great-grandson on the small farm that has sustained six generations of his family. That farm, nestled deep in a secluded canyon and accessible only by way of a winding, rugged lane, marks one end of Route 5010. Before it washed out years ago, the road connected Sanostee to Toadlena and Two Grey Hills, communities to the south that are known for their historic trading posts. Today, 5010 dead-ends just past Benally’s house, seven miles from the nearest paved road. Back then, going to town meant hitching a wagon to a team of horses, traveling up the steep incline and weaving around the boulder-fringed hairpin turns. In the mid-1950s, Benally’s mother dropped him off at a boarding school 10 miles away – too far for the daily commute by wagon. As a teen, Benally walked seven miles each way to a summer employment program. Still, Benally gave up a career as a silversmith in Albuquerque to raise his own children in the canyon. He learned to plan ahead, to stock up food and firewood, and to rely on his own resourcefulness to survive.